EASA Type Certification for EB29D! Optimum wing span and wing loading for every weather! 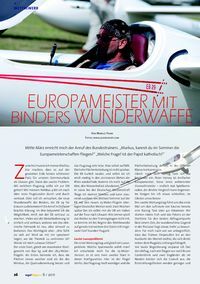 The latest serial numbers 028 and 029 of the EB29 went to the Top Pilots Alexander Müller and Tassilo Bode. And they are loving it. On May 4th Alexander made optimal use of the weather situation and flew 1155,8 km with a speed of 108.2 kph. This flight included a declared 1100 km FAI triangle. 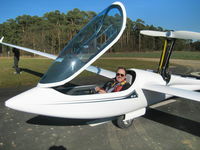 On landing Alexander was full of praises about his brand new EB29 and our congratulations go to the successful pilot. We wish Alexander Müller, Tassilo Bode and all EB pilots a very successful flying season 2014. Regardless of the trend to shorter wing spans in the open class, pilots who want to fly at the front of the competition cannot ignore the advantages of a great wingspan when flying in not so “ fast “ weather. 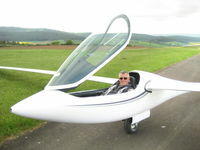 As the regulations for open class competitions allow to alter the wing span from day to day, we have made wing span optimization for our gliders very easy: since march 2011 we supply a new wingtip for our gliders EB29 and EB28 edition for a wing span of 25.3 m, in addition to the existing versions with 28.3 and 29.3 m.
Now you can choose the optimum wing span for every weather, in order to fly at the front of the competition or to enjoy an ideal pleasure flight. This concept has been succsesfully demonstrated by Michael Sommer winning the German open class championschips in 2011. Uli Schwenk: A dream came true!